The illegal trade in precious “rosewoods” is the world’s most valuable form of wildlife crime. Hundreds of people have been killed around the world trying to protect these rare trees from the gangs seeking to profit from the rapidly growing demand for luxury furniture in China. Having decimated most rosewood species in Southeastern Asia and Central America, this rapacious industry has now turned to Africa, and a dry forest species called “kosso” (Pterocarpus erinaceus) . 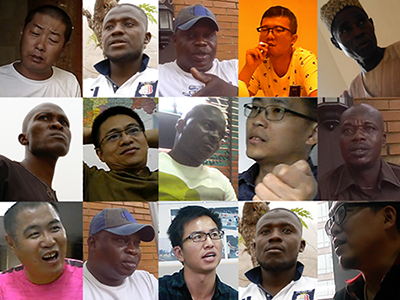 EIA’s investigators have spent two years exploring this booming illegal trade, including undercover meetings with more than 30 actors in the supply chain, from the arid forests in Nigeria to the sophisticated retail shops in China. Our investigation reveals that almost all the kosso coming from and through Nigeria for the past three years has been illegal. Most shockingly, EIA’s investigation has revealed that thousands of documents from the Convention on International Trade in Endangered Species of Wild Fauna and Flora (CITES) have been used in contravention of the core objectives of the Convention. 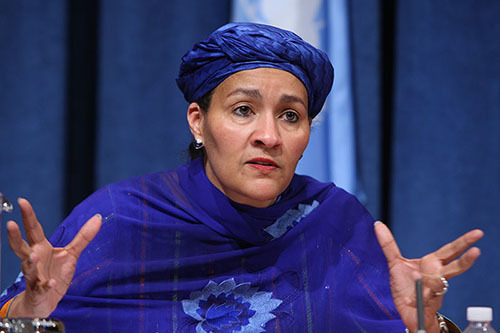 It appears that Mrs. Amina J. Mohammed, former Nigerian Minister of Environment, signed the CITES documents during her last days in office, just before she became the United Nations Deputy Secretary-General. The retrospective issuance of thousands of CITES permits is reportedly the result of a grand corruption scheme that involves over a million dollars paid by influential Chinese and Nigerian businessmen to senior Nigerian officials, some of the transaction facilitated by Chinese diplomats. Precious woods have been traded for centuries. But contemporary demand is most certainly unprecedented, triggering a cascade of commercial and biological extinctions of tree species, degrading pristine forest ecosystems, and ravaging the livelihoods of local communities. The trade in rosewood shares many economic features with elephant ivory, rhinoceros horn, and tiger skin trades: limited and vulnerable supply, high demand, and high levels of criminality and corruption. 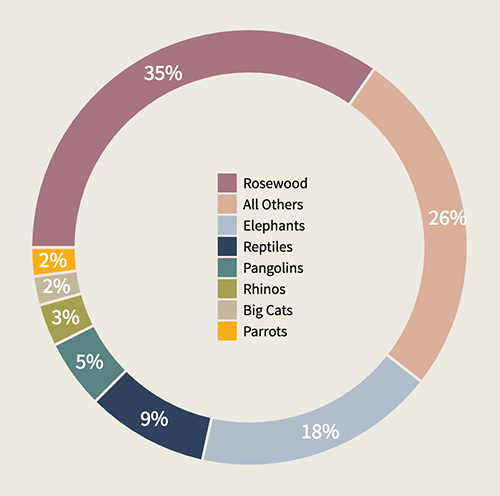 Rosewoods are now the most illegally traded wildlife products in the world, both in value and volume. 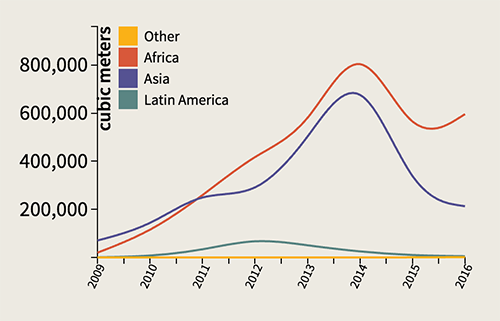 The aggregated value of seizures in rosewood between 2005 and 2014 represent more than all seizures related to elephants, big cats, rhinoceros, pangolins, parrots and turtles combined. Over the past decade, China has emerged as the epicenter of the international rosewood trading and trafficking routes. 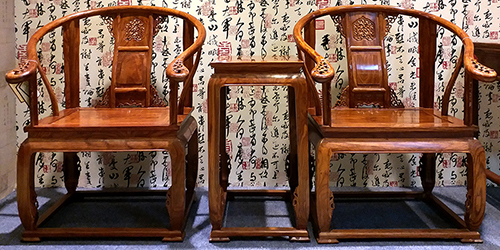 The Chinese demand has particularly, but not exclusively, targeted a group of thirty-three rosewood species, known as “red wood” (“hongmu” in Mandarin), used primarily for the reproduction of antique-style furniture. The rising demand is driven by the growing middle class, which is now able to afford what for centuries was available only to elites. Having depleted east and southeastern Asian forests of the most desirable rosewood species, traders began exploring other countries and continents in search of “new” species that could meet the growing Chinese demand. 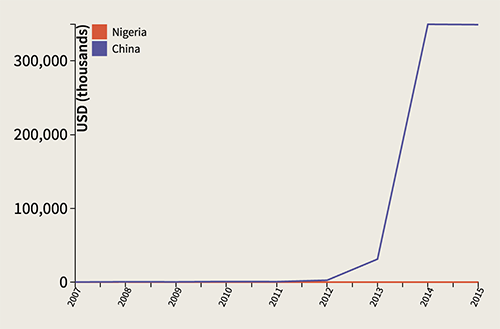 In 2013, rosewood exports from West Africa were negligible; two years later, the region had become China’s largest volume supplier of rosewood logs. Due mostly to the boom in rosewood exports, sparsely-forested West Africa exported almost as many logs to China in 2014 as the densely-forested countries of the Congo basin. From January 2015 to December 2016, approximately 61% of China’s rosewood imports came from West Africa. Over this period China has imported an annual average of 764,000 cubic meters, worth US$840 million, of West African rosewood. The trade in rosewood from West Africa has been focused on one particular species: Pterocarpus erinaceus, also called “kosso.” Kosso has become the most heavily traded tropical wood species in the world. Most of the cutting and trade of Pterocarpus erinaceus in West Africa is illegal from the very start. The rosewood logging and export have blatantly violated the harvest and/or log export bans adopted by most of the countries in the region. Sales of the timber have also fueled armed conflict in both the Ivory Coast and Senegal. In 2015, illegal kosso worth almost a quarter of a billion dollars was seized by West African governments. Yet this remains the tip of the iceberg. Faced with the overwhelming scale of the crisis, West African governments sought international help, through the Convention on International Trade in Endangered Species (CITES). The listing of kosso on CITES in 2016, consecutively on Appendix III and Appendix II, placed responsibility on consumer countries – principally China, but also Vietnam – to prevent imports of illegally sourced kosso. In a matter of months the country transformed from being a net importer of tropical logs to being the largest exporter of rosewood logs in the world and a major wood exporter on the continent. Between January 2014 and June 2017, every single day, an average of more than 40 shipping containers of rosewood logs were exported from Nigeria to China, equivalent to 5,600 logs and approximately 2,800 trees. In Nigeria, exporters have replicated a business model of total plunder, previously applied in several other countries, placing Nigeria on a course that will similarly guarantee exhaustion of its invaluable forest resources. The first populations exploited were those in close proximity to the export hub, in Lagos and neighboring states. Once these nearby resources were exhausted, the logging front moved steadily toward the east crossing the Central provinces, and one year later reached northeastern Nigeria. “Mr. F: In Benin I was also dealing with this wood, kosso. It started out in Benin, when it was exhausted we moved here. EIA: What about here [Nigeria]? “EIA: But if the logs are coming from there [area controlled by Boko Haram], what do you do? “EIA: So there are people who go over to the BH [Boko Haram] controlled areas to cut? Mr. T: Yes, there are people who go there, these guys usually stay in hotels and buy from local traders. EIA: So there are logs from that area? Mr. T: Yes, most of the wood comes from that area. […] Wood from Benue are of bigger size but core is not as hard. We will be able to tell if wood not from Taraba. Logs are becoming smaller and smaller, therefore, the cutting is moving up to the North. EIA: Are you not afraid? Mr. T: No, we are not going there! The local traders from Sagamu buy from people over there, we just wait here to buy from the traders. EIA: So you buy woods from BH controlled areas, you are supporting terrorism, no? “EIA: I have some wood from Taraba, you know it is illegal, all the war, rebel stuff going on… Do you think it will be a problem? Mr. H: No problem! As long as you have paperwork, nobody cares where your wood is from. EIA: Does China investigate that? 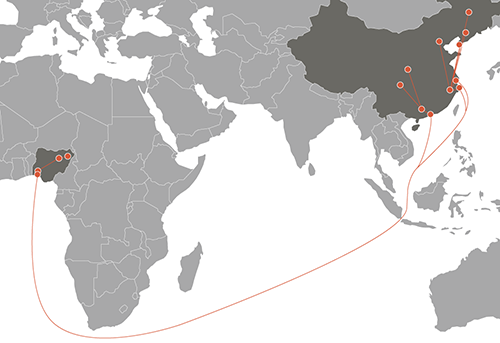 The Sino-Nigerian kosso supply chain encompasses a number of routes and geographies. 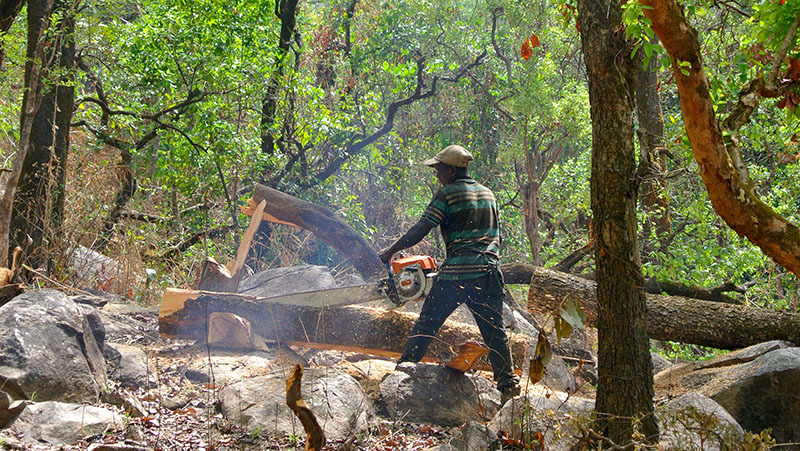 Because the forests in Nigeria’s southwestern and central states have been largely exhausted, kosso trees are now being cut in the remote northeastern region, frequently from community areas. The logs are dragged to logging yards accessible by road, trimmed into squared logs and loaded onto trucks for transport to the town of Sagamu (Odun state) on the other side of the country. After the forests in Nigeria’s South-Western and then Central states have been largely exhausted, kosso trees are now being cut in the remote North-Eastern region. 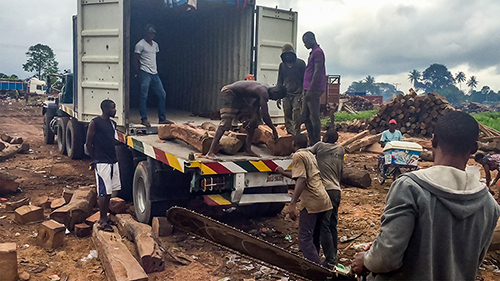 Most of the kosso logs harvested in Nigeria over the past four years have been transported through Sagamu, turning the little town on the outskirts of Lagos into one of the biggest rosewood trading hubs in the world. In Sagamu, the squared logs are unloaded from the trucks and piled up on “beaches” used by traders as showrooms for the potential buyers, or immediately reloaded onto 20-foot containers. The containers are then transported to the port of Apapa near Lagos, where – often invalid – export papers are issued for shipment to Vietnam and China. After six to eight weeks on the sea, the shipments reach destinations in Vietnam or China. Most kosso logs destined for China arrive at the ports of Guangzhou and Shanghai. Upon arrival, the containers loaded with African logs are transported to local markets located close to the three major rosewood furniture processing hubs in the country: Xinhui (Guangdong Province), Zhongshan (Guangdong Province), and Dongyang (Zhejiang Province). The logs are then transformed into furniture in nearby processing factories, and less than a month later the finished products are sent to customers and retail shops. In retail shops, labels indicate the Latin name of the species, along with the price of the furniture, dimensions and its denomination. As a basic rule, Xinhui and Zhongshan factories primarily supply the southern regions of China and Dongyang factories are principally oriented toward the eastern and northern markets. If the supply runs smoothly, a set of kosso furniture can be installed in the home of a Chinese family less than six months after the trees have been cut in northeastern Nigeria. As the national traders explained to EIA investigators, most of the logs exported from Nigeria in 2016 came from Taraba state. In an effort to curb rampant illegal logging and promote reforestation, the Taraba state government has banned the felling of trees, as well as trading and export of all timber species since August 2014. Growing pressure by the timber mafia eventually broke the state’s determination. Incentivized by the booming prices paid for kosso logs and the aggressive advances by Chinese exporters, scores of loggers rushed to the forests, penetrating even the most remote areas of the state. 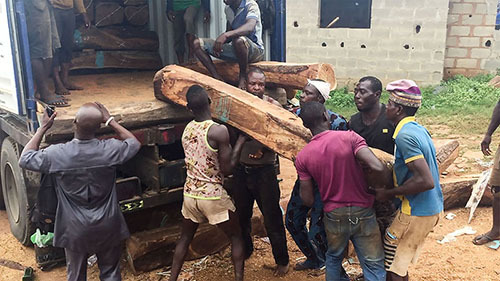 Overwhelmed by the rosewood rush and unable to effectively police the vast forest areas in the state, Taraba state government officials stopped seizing logs. Instead, officials started collecting additional fines (US$1,430 per trailer load of rosewood) for illegal wood at checkpoints while waving them through without further consequences, thereby de facto legitimizing the illegal trade. “EIA: Do you know if the logs you buy are illegal or not? Mr. W: According to law, it is illegal. 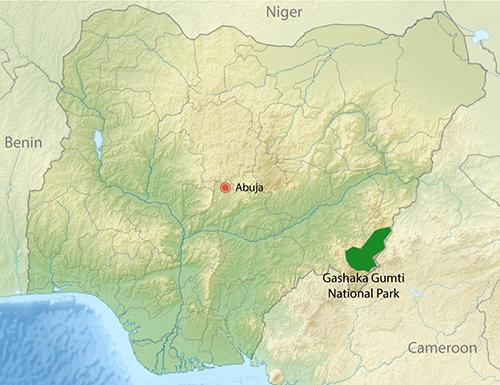 With the progressive exhaustion of the resources that are easily accessible in the heart of the Taraba state, networks have shifted their activities to new sites adjacent to the Gashaka-Gumti National Park. The largest single conservation area in Nigeria and the largest national park in West Africa, covering an area of 6,650 square kilometers, is now directly threatened by poaching and illegal logging. Lions (Panthera leo), leopards (Panthera pardus), buffalos (Syncerus caffer), several species of antelope (family Bovidae), elephants (Loxodonta africana), hippopotamuses (Hippopotamus amphibius), and crocodiles (family Crocodylidae) are all native to the park. 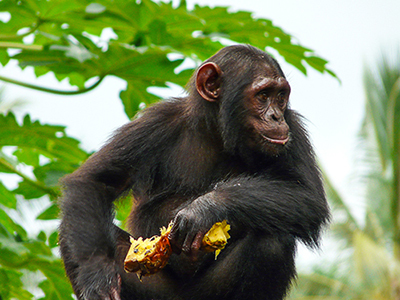 The park is known to be one of the most promising African sanctuaries for primates, and one of the last refuges for the most vulnerable chimpanzee in the world (Pan troglodytes ellioti), a subspecies which is endemic to Nigeria and Cameroon. As found by EIA investigators, intrusions into the national park for illegal logging of kosso increased in 2016. As local traders explained, the teams of loggers sent into the park usually make quick incursions at night, playing the game of “hide and seek” with the park rangers who are fighting the illegal logging. In 2016 and 2017, the park represents an untapped stock of timber, when most of the trees outside of the park have been already harvested. Several trucks loaded with rosewood have been seized by rangers inside the park in 2016 and early 2017. 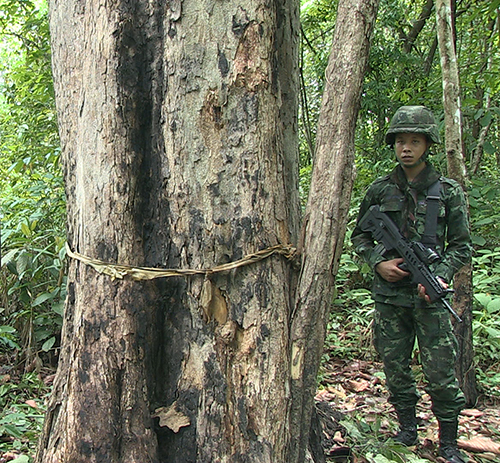 As explained by rangers, encounters with illegal bands of loggers are frequently violent. 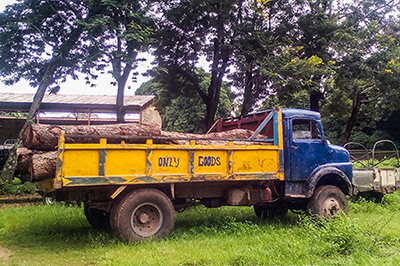 The recent seizure of logs and trucks inside the park reflects the increased number of patrols launched by authorities to curtail logging in the protected area. The vast majority of kosso is exported from Nigeria in violation of the long-standing export ban on logs. Until very recently, only a few countries had reported log imports from Nigeria. However, since 2014 the situation has changed dramatically, and reported log imports from Nigeria in destination countries have suddenly increased tenfold both in volume and value. Further analysis of available data shows a major discrepancy between exports reported by Nigerian customs versus import data reported by the customs in China, beginning in 2014. Nigerian authorities have consistently declared zero log exports, while Chinese authorities have registered the equivalent of US$350 million worth of imported logs from Nigeria in 2014 and 2015. The discrepancy illustrates the systemic lack of enforcement, prevailing corruption, and the absence of transparency in the Nigerian timber sector. According to existing legislation, only processed and “semi-processed” wood products, which meet a certain size and criteria defined by the Ministry of Environment can be exported. Such laws tend to be passed to both better control export of illegal wood, create jobs in producing countries and keep more value from the resource in these countries. Both traders and their agents admitted to EIA investigators that the dimensions of squared logs exported to China are far larger than the law allows, and that the illegality of the business is well known by the customs officials, who are in turn paid by the exporters’ agents to look the other way. “EIA: In theory this is all illegal, right? Mr. F: In theory, the government does not allow to ship these woods. Mr. Y: In theory, it is illegal, because the government issued regulation to ban it. But in Africa everything can be solved by money. That’s how they operate. Whatever source or good that is easy to sell, they put a ban on these goods, not just wood, fabric etc. are also on the ban list. That way, you need to bribe customs and other officials in order to export. 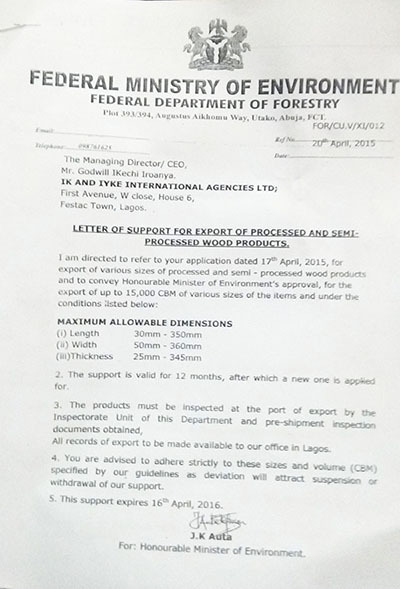 Prior to May 9, 2016, and the entry into force of the Appendix III listing of Pterocarpus erinaceus, forging practices and fraudulent use of official documents, both in Nigeria and China, focused on a variety of paperwork required for timber shipments to leave Nigerian ports and enter the Chinese market, including certificates of origin, phytosanitary certificates, and bills of lading. With the entry into force of the Appendix III listing, the falsification of official documents or the use of invalid official documents was extended to the required CITES certificate of origin. Literally flooded by dubious CITES certificates of origin produced both in Nigeria and in China, CITES Management Authorities of these countries decided to take specific measures of verification, as the Nigerian CITES authority explained to EIA investigators. Guided by the recommendations from the CITES Secretariat, Nigerian and Chinese Management Authorities established an efficient and rapid system: for each certificate they were presented, the Chinese Management Authority contacted the Nigerian Management Authority via email in order to obtain confirmation of the validity and veracity of the permit. Only once the permit was deemed authentic by Nigerian authorities was the shipment authorized to enter the Chinese domestic market. In contrast, when the permit presented to Chinese authorities was not recognized by Nigerian officers, the shipment was stopped at the border until a valid document could be presented. Over a period of approximately six months, commencing soon after the implementation of the Appendix III listing, a growing number of containers were stopped at the Chinese border and began to accumulate in Guangzhou and Shanghai ports. By the end of 2016, several traders and importers reported to EIA investigators that a total of 10,000-12,000 containers were stopped, equivalent to 1.4-1.6 million logs. “Mr. L: A lot of things can be handled, including having bigger [Chinese] companies flood officials who are issuing CITES certificates with dollars. It was so huge that officials lost their mind completely. In theory, you need to have a quota for certificates, but the money they gave to officials was just too huge for them to say no. A logistics agent who has been working with Chinese exporters for years told investigators that influential Chinese merchants reached out to the Chinese consulate in Nigeria, which allegedly facilitated a meeting with high Nigerian officials, which led to bribes paid to high level officials, including the Vice President. Worried by the loss of profit and the impact on their highly lucrative business, logistics agents moved swiftly to make sure the detained containers would be allowed to enter the Chinese market and positive signals were sent to potential investors in the Nigerian rosewood business. A member of the wood exporters association reported to EIA investigators that, using their long-established connections and influence, a group of representatives from his association met with members of the Congress to ask for their urgent help in order to obtain the much-needed CITES documents. He also told investigators that during a behind closed doors meeting that followed an official meeting in the capital, Abuja, the parliamentarians assured the agents that they could solve their problem with money. Exporters and agents indicated repeatedly to EIA investigators that the bribes paid to senior officials in Nigeria were the single triggering factor for the issuance of several thousands of CITES permits by the Nigerian Management Authority. Sources clarified that the documents issued to the agents were shared with Chinese importers who used them to clear one seized shipment after another in China. After months of investigation and evidences cross-checking, EIA uncovered strong evidence that approximately 4,000 permits were retrospective issued by the Nigerian Management Authority in early 2017. The permits were used by importers and their agents to clear the 12,000 detained containers. Evidence suggests that the 10,000+ containers, equivalent to at least 1.4 million logs and over US$300 million, were exported in violation of both CITES rules and Nigerian national law. The vast majority of the kosso squared logs have been exported in breach of Nigeria’s federal log export ban, which only allows “processed products” of a certain dimension to lawfully leave the country. 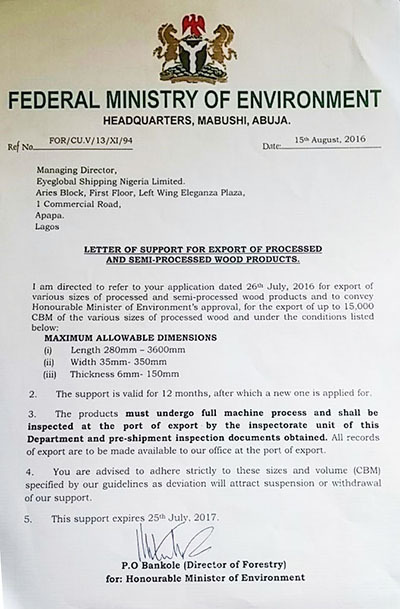 Moreover, the wood had left Nigeria without valid CITES certificate of origin, required under Appendix III upon exiting the country of origin. Regarding the retrospective issuance of permits by the Nigerian Management Authority, the Secretariat stated on several occasions that “the retrospective issuance of permits and certificates has an increasingly negative impact on the possibilities for properly enforcing the Convention and leads to the creation of loopholes for illegal trade”. , As a consequence the Secretariat formally recommends to the Management Authority of exporting countries not to issue CITES permits or certificates retrospectively and to the Management Authority of importing countries, not to accept permits or certificates that were issued retrospectively. 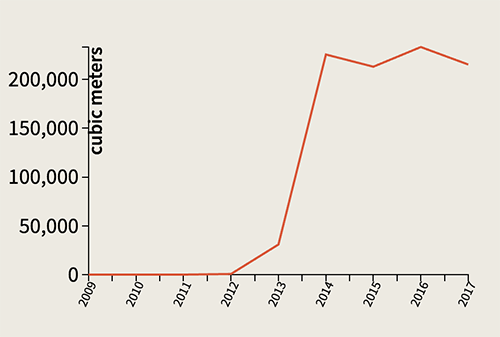 According to EIA’s investigation, Mrs. Mohammed was the Minister of Environment in Nigeria who appears to have signed these retrospective CITES permits. 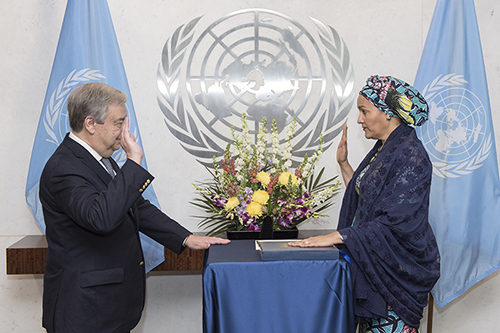 Mrs. Amina J. Mohammed has had an extraordinary career and is described as an exemplary public official revered by many , She has come to assume the highest responsibilities in Nigeria and at the international level. The CITES Management Authority is part of the Federal Department of Forestry, under the Federal Ministry of Environment in Nigeria. At the time the retroactive CITES documents were issued, Mrs. Mohammed was formally responsible for the actions of the Management Authority. Moreover, as explained by the Management Authority to EIA investigators, the Minister of Environment is the sole signatory of CITES permits in Nigeria. As a source close to the former Minister of Environment indicated to EIA investigators, it took hours and days, until late at night sometimes, for Mrs. Mohammed to sign the vast quantity of documents , all a few days before she left her position with the government, to go to New York and assume her new role of UN Deputy Secretary-General. Furthermore the signature that appears on the sample of permits is extremely similar to the one shown in an official document signed by Mrs. Mohammed in her new position, and obtained by EIA. All seems to indicate that Mrs. Mohammed did sign the sample of six permits with serial numbers between 1,581 and 3,806, and so that the UN Deputy Secretary-General signed approximately 4,000 permits that were used to facilitate the entry of 1.4 million illegal logs stopped at the Chinese border. The details about the bribes allegedly paid to senior Nigerian officials, provided to EIA investigators by exporters and agents, appear to implicate Mrs. Mohammed. The position of Minister of Environment, which Mrs. Mohammed occupied in the Nigerian government at the time the CITES documents were issued is unambiguously referred to by the Chinese exporter who claims that the CITES permits were issued in January 2017 only after Chinese businessmen “flooded officials who are issuing CITES certificates with dollars” (see above). A member of the wood exporters association in Nigeria, close to the representatives who allegedly traveled to Abuja to resolve the problem of the detained containers, claimed that the “Minister,” apparently referring to the Minister of Environment, specifically received “some money” from wealthy Chinese entrepreneurs. EIA's investigation demonstrates the challenge that the timber listed species represent for the implementation of the Convention: Nigeria has gone from exporting a few hundred specimens of species included in the CITES Appendices in 2014 and 2015 to more than a million in 2016. And at the time EIA closed the investigation for this report, on September 15, 2017 no data for the trade in specimens of species included in the CITES Appendices exported from Nigeria in 2016 was publicly available. The current reporting practices and monitoring of the implementation of the Convention are inadequate to cope with the high flexibility and reactiveness demonstrated by the international criminal networks. Sino-Nigerian criminal networks took advantage of the extreme decentralization and opacity of the licensing system, due to the Convention’s lack of resources, to launder illegally traded wood using CITES paperwork. Under its current permitting system CITES is unable to stop these abuses and to effectively combat the illegal trade in endangered trees. In order to meet the challenge of the illegal trade and maintain the Convention’s integrity, EIA firmly believes that CITES needs to undertake profound reforms that will build on existing processes and discussions, and will bring accountability and transparency into its licensing system. China, for its part, unrivaled center of the global trade in precious and vulnerable rosewood trees, needs to lead the support for such CITES reforms. It also needs to go beyond, as an international leader in the fight against global warming. The case of the Nigerian kosso demonstrates how for years Chinese demand has catalyzed the uncontrolled illegal logging and trade, which has led to the devastation of thousands of kilometers of forests and compromises Nigeria’s capacity to fulfill its Sustainable Development Goals. As a committed global leader on climate change, China needs to institute a prohibition on importing illegally sourced timber, whether it is listed on CITES or not. It is vital for Nigeria to immediately put an end to the looting of its forests, and engage the renovation of its forest sector, transforming it into an effectively regulated branch of its economy, respectful of the environment and its citizen. • Suspend trade immediately in all CITES-listed timber species from Nigeria. • Conduct a thorough investigation into the export of Pterocarpus erinaceus from Nigeria to China, and make public the results of the investigation. • Considerably improve transparency, accountability and monitoring of the licensing system through the creation of a real-time electronic database for all CITES permits and certificates issued, accessible to the Secretariat, all Parties and third parties. • Conduct a criminal investigation with the support of INTERPOL into the allegations of grand corruption related to the issuance of CITES documents and into officials’ complicity in the routine export of logs in breach of the national log export ban. • Permanently prohibit the harvest (state level) and export (federal level) of Pterocarpus erinaceus. • Suspend all wood exports until the investigation by the CITES Secretariat and INTERPOL are completed, and the criminals involved in the illegal export of rosewood are convicted. • Profoundly reform the timber sector from the allocation of forest rights to the export of forest products, in order to strengthen forest governance, and effectively dissuade and combat illegal logging and related trade. • Enforce the second provision to Article 164 of the National Criminal Law that criminalizes bribes given to non-Chinese public officials and to officials of an international public organization. • Extend the systematic verification of the CITES permits and certificates validity with the authorities of the countries of origin to all CITES listed timber species. • Prohibit the import of illegal timber, which has been harvested, transported or traded in contravention of international or national laws.